BOSTON (AP) Joel Embiid is headed to the NBA All-Star game for the first time, and he celebrated with another impressive performance. 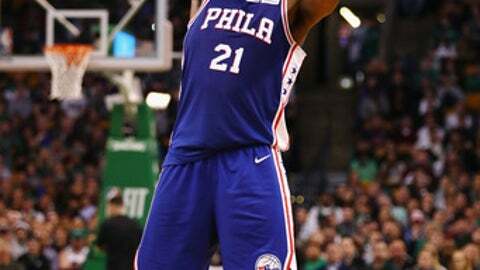 Embiid scored 26 points and matched a career best with 16 rebounds, leading the 76ers to an 89-80 win over the Boston Celtics on Thursday night. Dario Saric scored 16 for Philadelphia, which won for the sixth time in seven games. T.J. McConnell had 15 points – all in the second half. Just one week after Boston erased a 22-point deficit on its way to a 114-103 victory over Philadelphia in London, the Sixers led by as many as 21 and turned away one last rally by the Celtics down the stretch. Boston played without All-Star guard Kyrie Irving, who rested a sore left shoulder. Al Horford and Marcus Morris each scored 14 points. After winning seven in a row, Boston has lost two straight. The Celtics had no answer for Embiid, who was 10 for 19 from the floor and 6 of 7 at the foul line. He also had six assists and blocked two shots. The Sixers forced 19 turnovers and outrebounded the Celtics 41-31 while avoiding a season sweep. Marcus Smart scored 13 and Jaylen Brown had 12 points for Boston. Embiid scored 10 in the third quarter and McConnell had nine points in the period, helping the Sixers pull away. Jayson Tatum’s 3-pointer with 2:01 remaining trimmed Philadelphia’s lead to 86-79, but Boston’s rally fizzled from there. Halfway through the season, much-improved Philadelphia (21-20) is in playoff contention. The Sixers are coming off wins against the top two teams in the Eastern Conference this week in Toronto (30-13) and Boston (34-12). Embiid pulled down 16 rebounds for the third time in his career. He got the news earlier Thursday that he was the first Philadelphia player selected as an All-Star starter since Allen Iverson in the 2010-2011 season. Embiid is the first Sixers All-Star since Jrue Holiday in 2013. ”I’m just very proud of him,” coach Brett Brown said. 76ers: McConnell was coming off a career-high 18 points Monday against Toronto. … JJ Redick, who injured his left leg Monday against Toronto, did not play. Celtics: Irving made the All-Star game for the fifth time. … The Celtics honored Jo Jo White, a two-time NBA champion who played 10 seasons for Boston, with a video tribute and a No. 10 draped over his regular seat. White died Tuesday at age 71. 76ers: Host Milwaukee on Saturday night. Celtics: Host Orlando on Sunday.